It was obviously common knowledge amongst local people, especially inquisitive youths that “a fiery lake” existed at Rattlechain that was “a peril to children”. It was also well known amongst canal boatmen that this cargo presented special risks during the time that it was transported by water. Albright and Wilson the company and its many backers had tried to keep a lid on this passing it off as “legend” or “myth”- hence the calcium phosphate nonsense that has been often repeated to try to disguise the p4 in the lagoon. Others have attempted to repeat this lie for their own avarice. However on 8th October 1989, a white phosphorus fire event occurred which thrust unwanted attention onto the site, almost as though the demon of white phosphorus was trying to be unleashed. The following article appeared in the local Express and Star. It is worth noting that the information contained in it, including that given to the fire service was briefed from Albright and Wilson works Management- and is thus a desperate attempt to quell the public concern. Some observations from this article and statements contained within it. 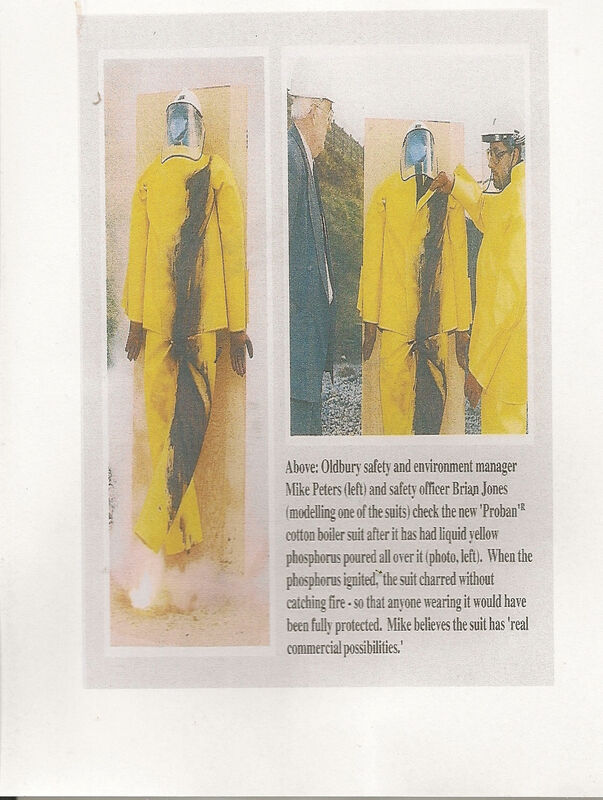 The paper identifies it as “a poison cloud” and “a potentially dangerous chemical”- which is completely accurate. White phosphorus is a banned rat poison and is highly toxic. 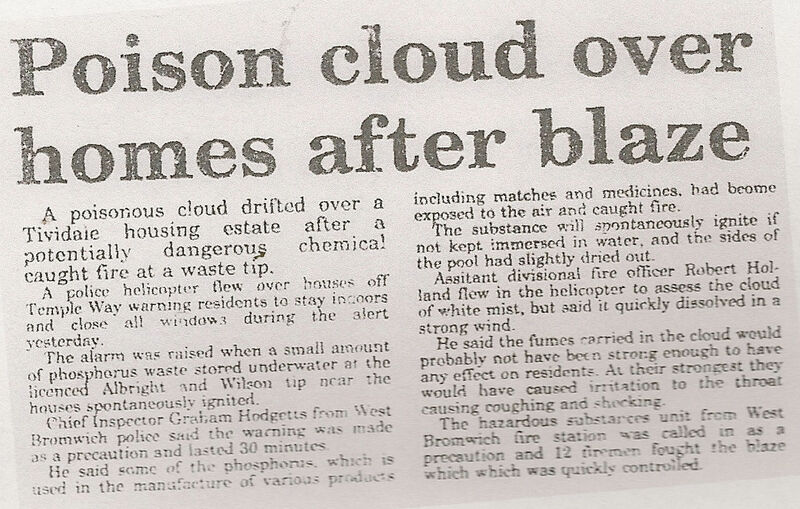 The cloud refered to is a mixture of phosphorus vapour and phosphorus pentoxide- which is also capable of causing severe problems to the respiratory tract. We have the often used cliche of “small amount” applied to p4- they were spinning the same yarns back then also. 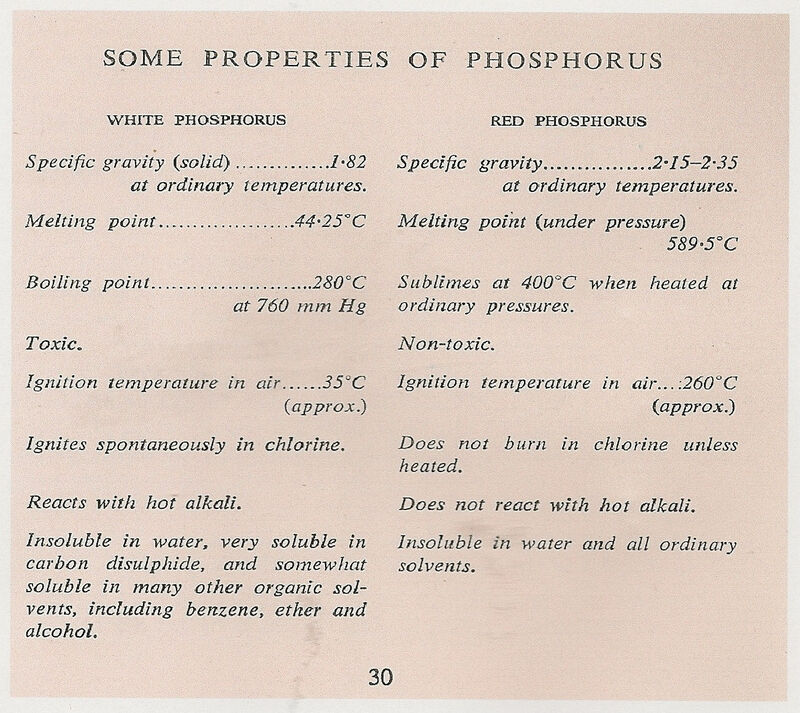 “Phosphorus” is linked to matches and medicines- thus trying to present it as reasonably harmless in contrast to the poison that it actually is. P4 IS NOT USED IN MEDICINES OR MATCHES THESE DAYS AND WAS BANNED BECAUSE OF ITS POISON PROPERTIES. This strikes of PR lies from the Albright and Wilson briefing factory. The “white mist” is oxidising white phosphorus, and has already been demonstrated DOES PRESENT A HUMAN HEALTH RISK. 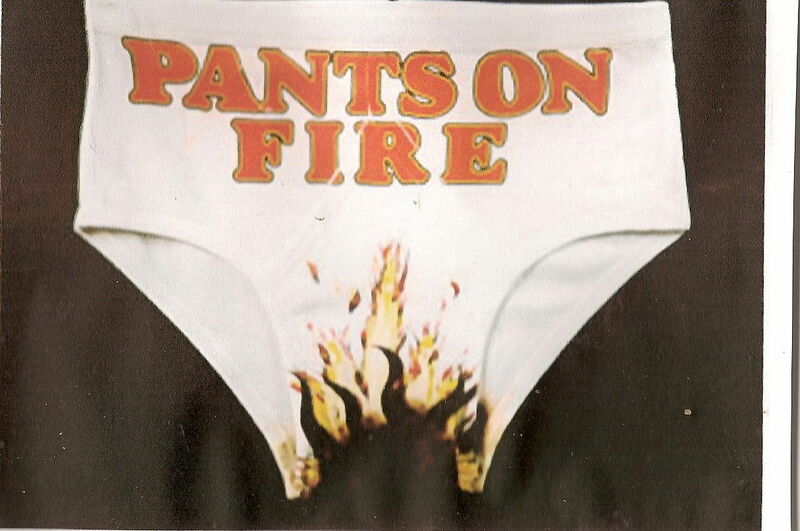 We appear to have the fire service spokesman trying to play down this incident. This appears to be the typical soothing of community concerns that the emergency services like to roleplay. “Quickly controlled” for example. The presence of the police helicopter does not indicate that this was a typical routine fire, does it not? Perhaps it is time they stopped treating us like fools, dealing in business protective propaganda and told us the truth instead of playing down environmental releases such as this. We are also uneasy about the links between WM fireservice and Albright and Wilson over the years, where their retained firefighters regularly trained with the professionals. 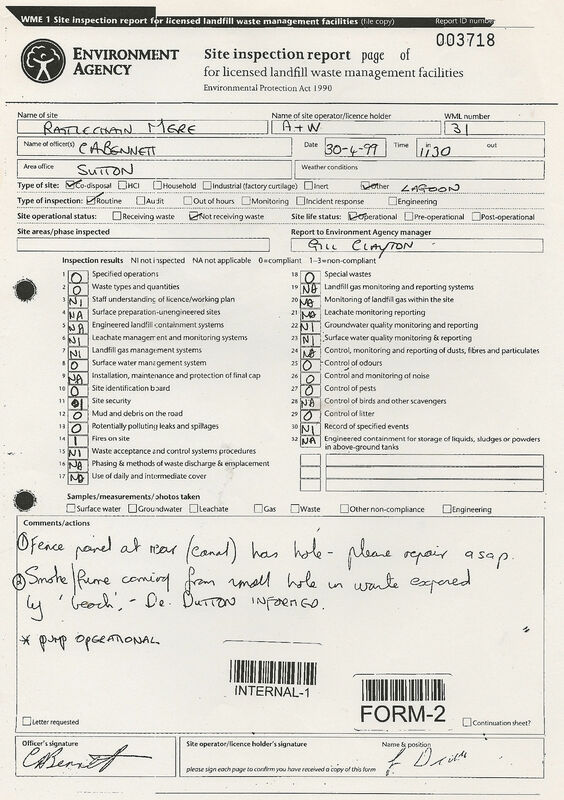 The following “official explanation” offered as to the cause of the fire was given by Health and Safety manager Frances Michael Peters. The incompetence of the tanker driver in question, and that of the management themselves for not putting into practice relevant contingencies allowed “the myth” to reveal the truth of what resided in the lagoon. That it came from “the bottom of the settling tanks” according to Peters, belies that it was scraped onto the top of the open Rattlechain lagoon under water. He also tries to blame the incident on “the fine dry weather”- this was in October, so the temperature was unlikely to have been above 35 degrees centigrade which Albright and Wilson give as the ignition temperature of the chemical. It must be questioned therefore as to whether this temperature is an accurate one for the real ignition temperature of this substance. 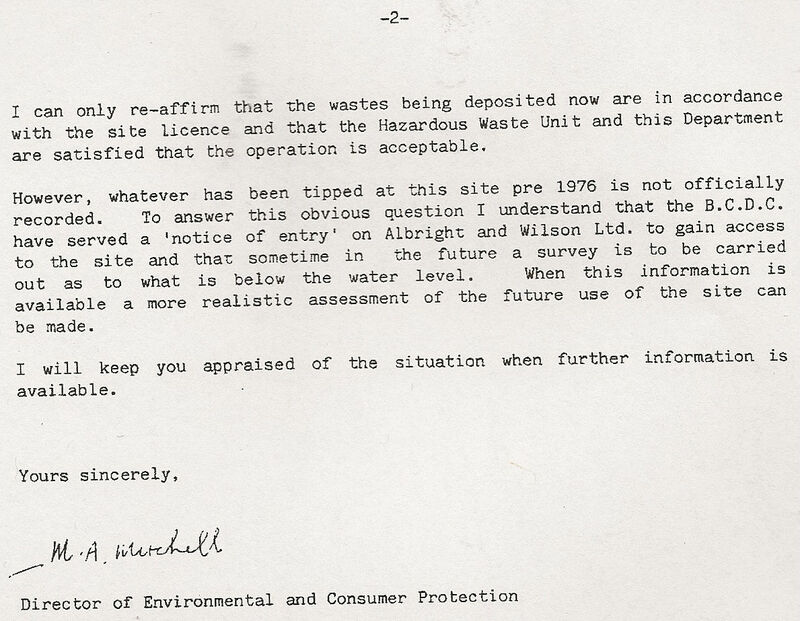 Based on this letter we asked a freedom of information request, asking if Sandwell Council as then regulators had on file a reply from The Hazardous waste unit. They stated they did not. This particular P4 fire incident generated community concern and a subsequent members inquiry by a Sandwell local councillor, which indicates that it was well on radar of this Council’s environmental health department, which makes their claims of unknowing indifference to the bird deaths on site even more difficult to swallow. 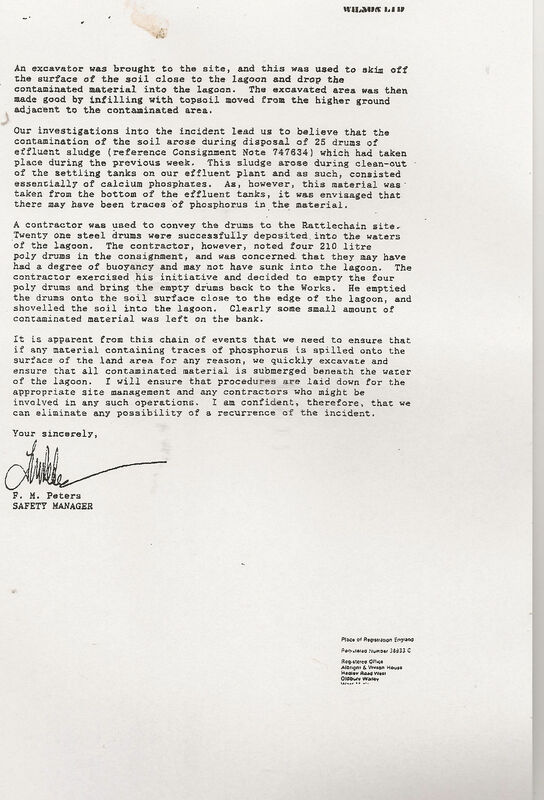 It confirms that contaminated earth from around the dismantled phosphorus plant WAS dumped into Rattlechain lagoon! It also mentions the Cremer and Warner report which was to be carried out the following year. 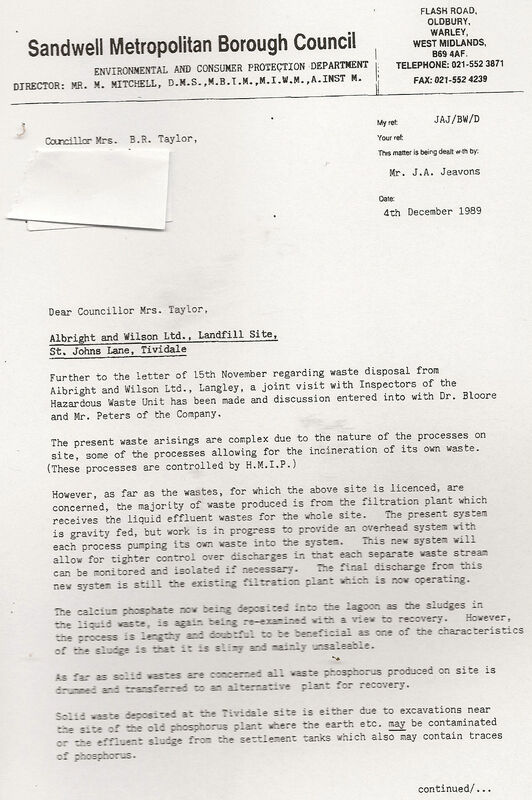 Not only does this offer further insight regarding the waste management system at Trinity Street, but confirmation that historic waste tipping received no “official” regulation whatsoever. 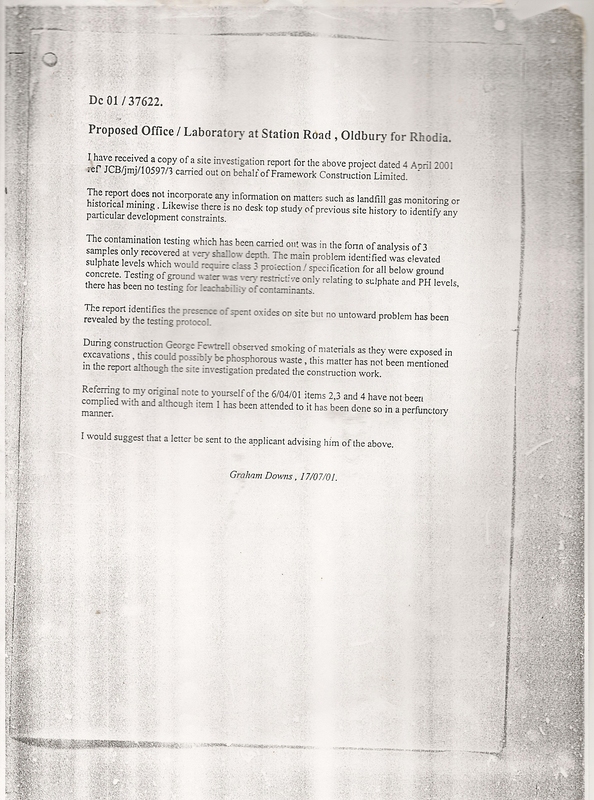 It is also clear to Sandwell council’s own planning department that the development of part of the Trinity Street site soil excavations produced smoking. 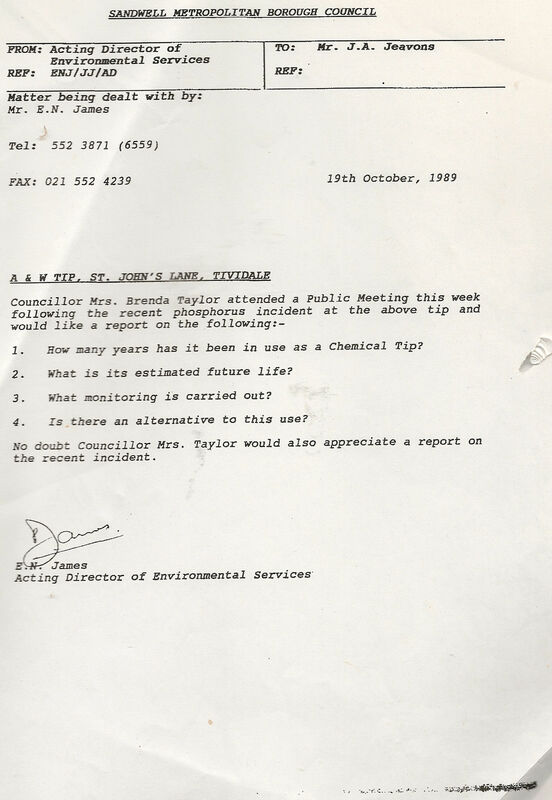 On 30/4/99 , not long before the AW brand burnt itself out permanently, the Environment agency issued the following incident form after seeing white phosphorus igniting at the site for themselves. 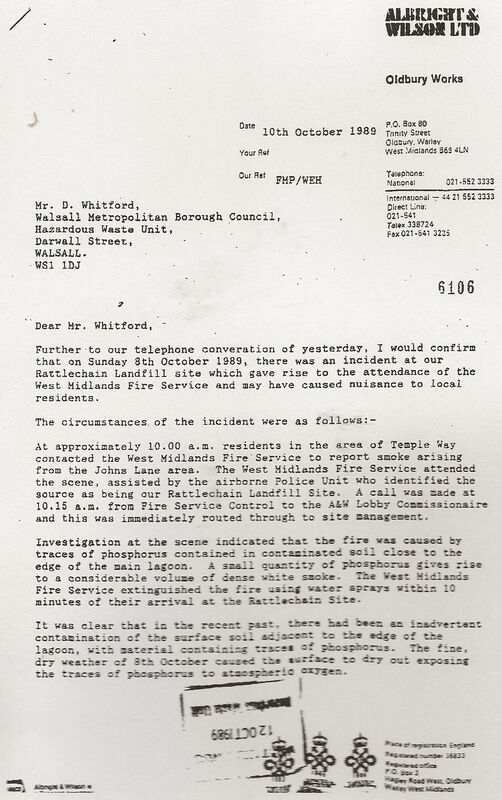 We asked a freedom of information request of West Midlands Fire service about the 1989 fire and another where some barrels removed from sediment in the lagoon caught fire after drying out. White phosphorus it seems has a nasty habit of coming to the surface when the site owners don’t expect it to.